(On TV, December 2014) The advantage of being director/actor Clint Eastwood is being famous enough to indulge into a bit of self-deconstruction with wider archetypical implications. 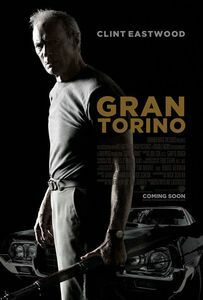 At least that’s the message I’m getting from Gran Torino, which seems delighted to mess around with ideas of masculinity as often set in stone by Eastwood. The dramatic possibilities are obvious once the basic premise is established: an isolated widower, displeased at the immigrant family moving next door, forced to coach an aimless teenager about the finer points of what it means to be a man. Squinting, grunting and cursing like a self-parody of himself, Eastwood eventually punches through his caricature to reveal a different kind of steely resolve, one that shows self-sacrifice as being the ultimate expression of service. As with most of Eastwood’s films, Gran Torino doesn’t play well with details: The actors (all chosen from within a select ethnic group, causing controversies best described on Wikipedia) aren’t all fine thespians, and Gran Torino plays better as a story than a piece of cinematographic art. Still, it flows nicely, deals with social issues of clashing ethnicity and justice and does offer a bit of an unconventional take on the big dramatic finale. Irreverent, surprisingly sentimental in a very “crying manly tears” fashion, Gran Torino does stand not only as an interesting film in its own right, but kind of a last-days answer to many films in Eastwood’s filmography.